We needed courage to find our allotment for the first time. The vast area east of Victoria Park has a dust bleakness, unusual for London. If bicycling there we have to keep away from the kerb to avoid broken glass and rusty metal. The smell of burnt cow hair from the meat processing plant adds to the atmosphere. The only clue that there is any gardening life in the area is the wild rocket pushing out of the cracks in the pavement. Beside the bus depot, out of sight of the road, is a barbed rusty gate, behind which things change dramatically. You can't help but gasp when you open the gate and find yourself standing at the foot of a 70-metre bridge high over the river, looking across to a bank of wild plums, elderflower and blackberries. There is not a building in sight, just the odd proud shed. Here are the land and the community that have been so important to us over the past seven years. And this is the scene where Moro East is set. 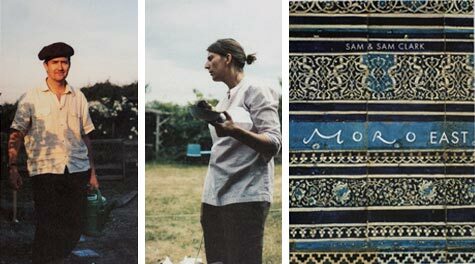 For those of you not familiar with Sam and Sam Clark, they run the much-praised UK restaurant, Moro. 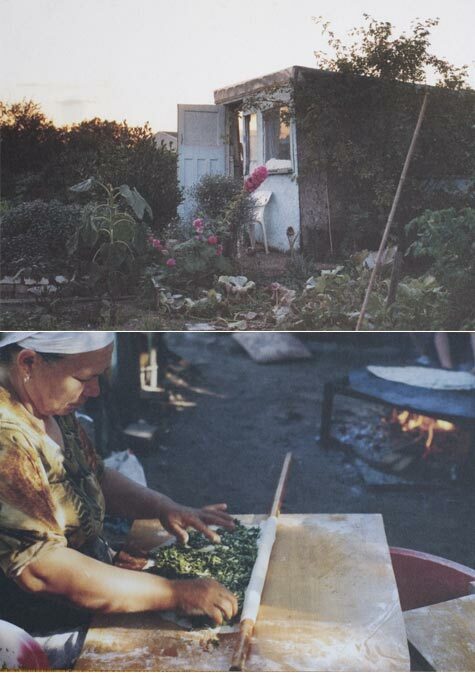 A few years back the couple took on an East End swatch of land at the Manor Garden Allotments - this cookbook, their third, tells the story of their experience over the course of a year, through a wide range of inspired recipes. According to the book the allotments were established in 1900 by Arthur Villiers. The 81 plots eventually flourished into a thriving multicultural community of not only Londoners but also families from Greece, Italy, Cyprus, Turkey, and the West Indies. A rich range of crops also evolved - many of which are featured in Moro East in recipes like Pumpkin Pisto, Jewelled Pumpkin Rice, Allotment Herb Salad, Syrian Fattoush, Tomato Soup with Cumin & Figs, Chard with Chickpeas & Tahini, Rhubard and Rosewater Fool, and Baked Beetroot with Horseradish & Almond Sauce. All was lost in late 2007 when the site was bulldozed by the 2012 Olympic Committee. Despite a campaign by the Manor Gardens Allotment Society to have the allotments incorporated into the Olympic site, this fertile land will be concreted over and used, for the four weeks of the games, as a pathway between stadiums. You can read more about what transpired here, and in this Guardian article as well. After spending some time with Moro East, I chose this beautiful pomegranate salad recipe to feature - it's perfect for the holidays. After just a bit of prep you end up with a wonderfully textured, color-flecked salad - imagine the crunch of celery and walnuts, and the occasional pop of pomegranate seeds. The salted garlic undercurrent of the simple pomegranate dressing adds just the right balance to the tangy sweetness of the vibrant juice. Easy, delicious, and a pretty addition to any table. Moro East is currently shipping through Amazon.co.uk. Those of you here in the U.S who are interested might have to wait a couple weeks - Amazon is currently taking pre-orders for a 12/24 ship date of Moro East. HS notes: I toasted the walnuts. Also, to get the seeds out of a pomegranate cut the fruit into wedges. Place the wedges in a large bowl of water and break the wedges apart to remove the seeds. The seeds will sink to the bottom and the bitter pith and skin will float to the top making it easy to remove. To juice the seeds I simply place small handfuls into a handheld citrus juicer and let the juice run into a separate bowl. For the dressing, whisk all the ingredients together, season to taste with salt and pepper and set aside. Put the bulgur in a bowl, add (hs note: boiling hot) water to just below the surface of the wheat and leave it to stand for 10 minutes (hs note: 10 - 15 minutes), until just tender but still quite al dente. Add more water as required or drain in a colander if too wet. Put all the ingredients in a bowl, pour over the dressing and check the seasoning. Serve immediately. Make sure the walnuts are dressed just before serving, as sometimes they can impart a bitter flavour and unpleasant colour to the dressing if left to sit. 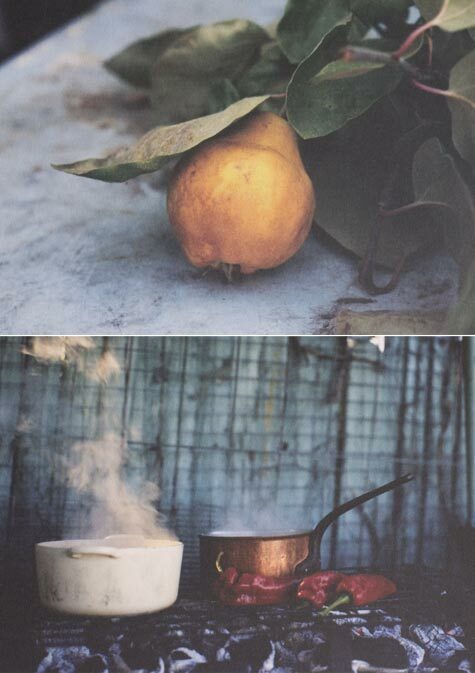 from Moro East by Samuel and Samantha Clark (Ebury Press, 2007) - reprinted with permission.